Posted by: Ash on December 11th, 2018, in Guides. Tags: Ecuador, Galapagos Islands, Wildlife. The Galapagos Islands are one of the world’s favorite travel destinations. Enjoy beautiful scenery, warm weather and incredible wildlife opportunities. Located about 550 miles (900 km) off of Ecuador, the Galapagos Islands are well within the world’s tropics and offer a very pleasant climate. The isolation, climate and ocean currents have come together to offer a unique travel experience. Because of their location, you will fly from Quito to one of two airports serving the islands. One of these is on Baltra Island and the other is on San Cristobal. Which one of these you fly to will depend on where your cruise departs, where your hotel is located or which island you plan on visiting first. There are 21 islands in total and most of these can be explored on guided trail walks, snorkeling adventures, kayaking trips and diving. Protected by the UNESCO listed Galapagos National Park, enjoy diverse birdlife, fascinating land and ocean-going animals, beautiful beaches, impressive geological features and areas of historical significance. With everything on offer, the Galapagos offer something for everyone and provide an ideal family or group vacation, romantic getaway or solo trip. 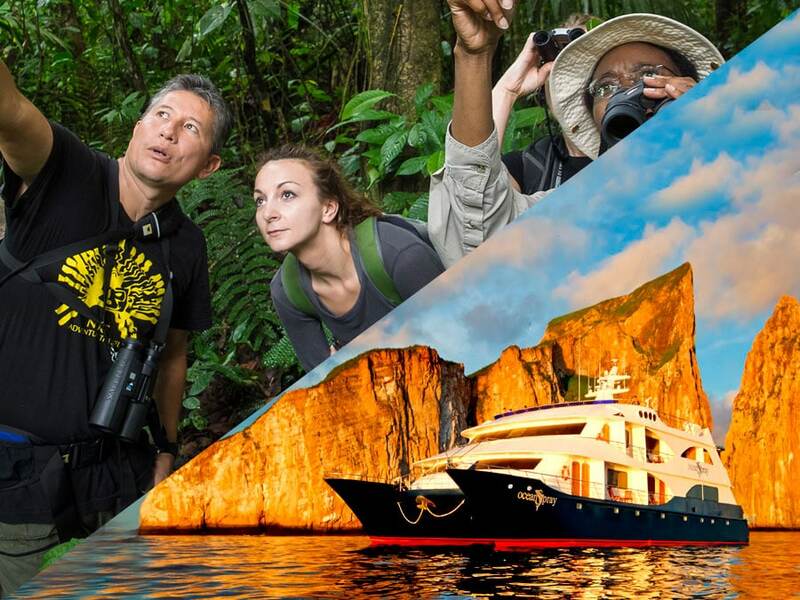 The Petrel cruise offers a luxury-class catamaran expedition of the Galapagos Islands. Enjoy a comfortable cruise, trail walks across the islands led by qualified naturalists, snorkeling adventures and kayaking opportunities. Choose from different Perel itineraries to include the islands you would like to visit, wildlife you want to find or days you have available. The Perel vessel itself is designed for comfort, stability and performance. This is one of the newest cruises for the Galapagos Islands and treats you to an unforgettable experience. Aboard the cruise, enjoy comfortable, spacious suites with modern bathrooms and your private balcony, a comfortable lounge, and jacuzzi. On your excursions from the Petrel Cruise, you will explore the Galapagos with a focus on the region’s incredible natural history. You will be treated to some incredible wildlife opportunities. Your guide will help you find the iconic marine iguanas, sea lions, sea turtles, giant tortoises, Darwin’s finches and many other Galapagos birds. To provide a summary of what to expect, the Petrel Cruise 8-Day Galapagos Itinerary ‘B’ begins on San Cristobal Island where you will have an introduction with giant tortoises. The next day, you will visit the famous Gardner Bay, Osborn Islet, and Suárez Point on Española Island. 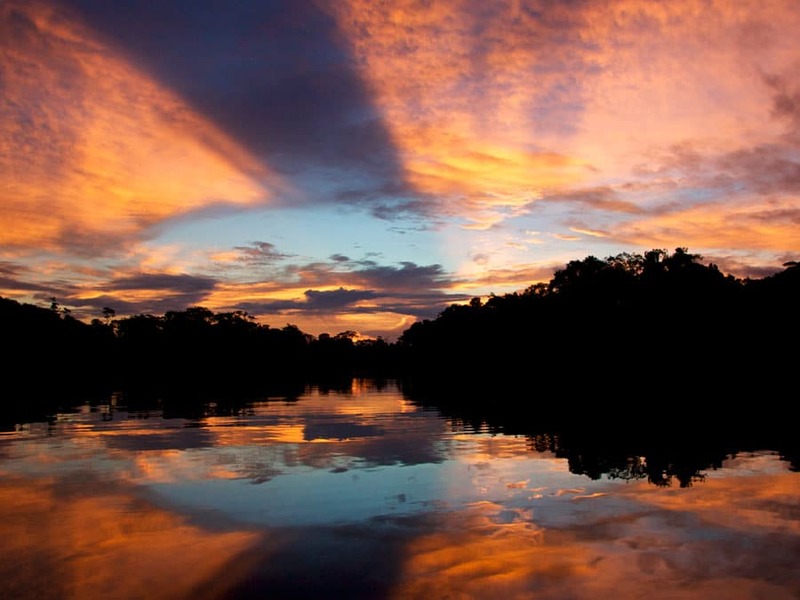 These areas offer incredible wildlife and beautiful Galapagos scenery. 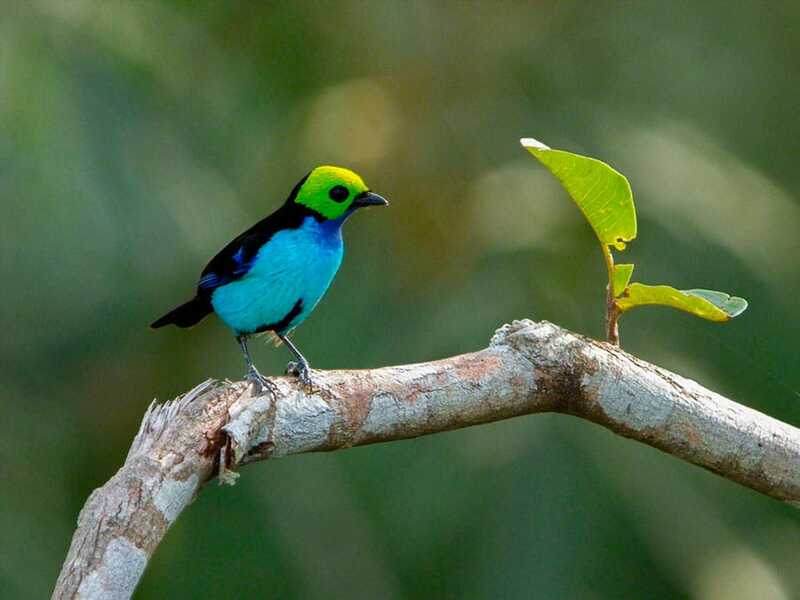 After a relaxing night’s sleep, you will explore Floreana Island for its incredible colored beaches, diverse birdlife and snorkeling opportunities. There are many colorful fish to see, as well as sharks and rays. After this, you will visit Santa Cruz Island and the Charles Darwin Research Center. Learn about the work the Charles Darwin Foundation is doing to restore and protect the islands, as well as view the giant tortoises and iguanas at the facility. You will then see the lava formations of Bartholomew Island and learn about the formation of this interesting land mass. After this, spot the marine iguanas, red-footed boobies, sea lions, sally lightfoot crabs, and beautiful beaches of Genovesa, Mosquera and Santiago Island. The Ocean Spray Galapagos Cruise is another vessel to explore the Galapagos Islands. The catamaran design offers more stability than many other Galapagos cruises and the vessel was built to maximize comfort and performance. 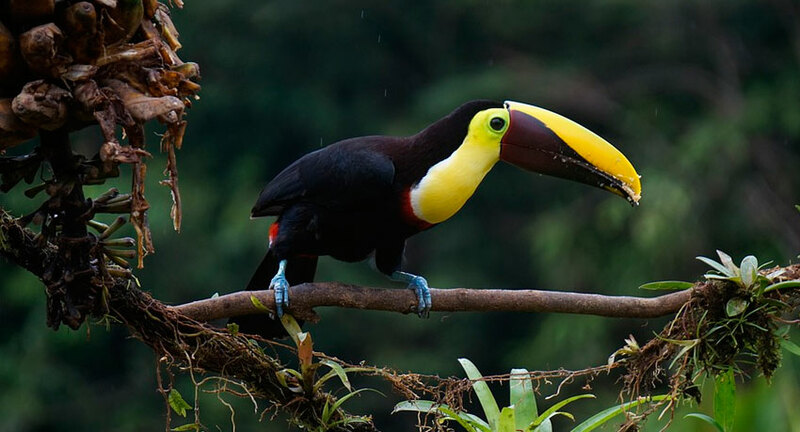 While on the cruise, enjoy guided expeditions around the islands to find iconic wildlife. Explore on guided trail walks, kayaking trips, and snorkeling tours. As you explore the islands, you will also enjoy the Ocean Spray facilities. The vessel offers spacious and comfortable accommodation, a sundeck and jacuzzi, and delicious meals. Your suite also offers a private balcony to keep you connected to the scenery and wildlife. Like the Petrel Cruise above, you have a choice of itineraries from a 4-day experience to a 15-day mega cruise for in depth exploration of the Galapagos. This itinerary includes visits to the central and southern islands of the Galapagos. These include the top visitor sights of Santa Fe, Española, San Cristobal, and Floreana Island. While exploring the islands, you will visit beautiful beaches, enjoy stunning scenery and see the iconic and less familiar wildlife of the Galapagos. Animals you’re likely to see are waved albatross, lava lizards, blue-footed boobies, marine iguanas, sea lions and even flamingoes. While exploring on kayaking and snorkeling tours, you’re likely to see green turtles, rays, lots of tropical fish, and more iguanas and sea lions. 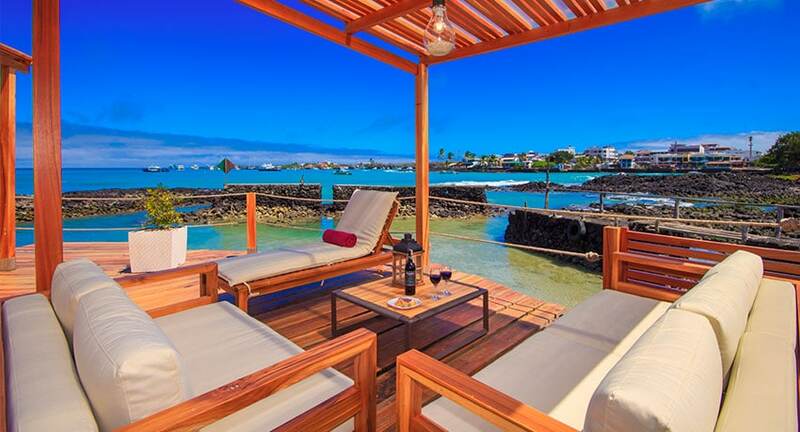 The Galapagos Habitat Hotel (previously the Red Mangrove) offers luxury accommodation and delicious food on Santa Cruz Island, which is one of the largest islands of the Galapagos. The hotel is next to the Charles Darwin Research Center and near many good restaurants and things to do. There are different cafes, galleries, attractions and the dock for accessing other islands within walking distance from the hotel. You can also enjoy the Galapagos Habitat Package Tours to give you some more fluid exploration of the Galapagos. The hotel is also the home of the highly rated Almar Restaurant by Isla Grill for some delicious cuisine with Ecuadorian and Argentinian influence. Even from the hotel deck, you can enjoy viewing marine iguanas, sea lions, cormorants and large pelicans. The iguanas and sea lions come very close and even sun themselves between the tables and chairs of the hotel restaurant. The Alya Galapagos Cruise offers island exploration aboard a very comfortable catamaran. 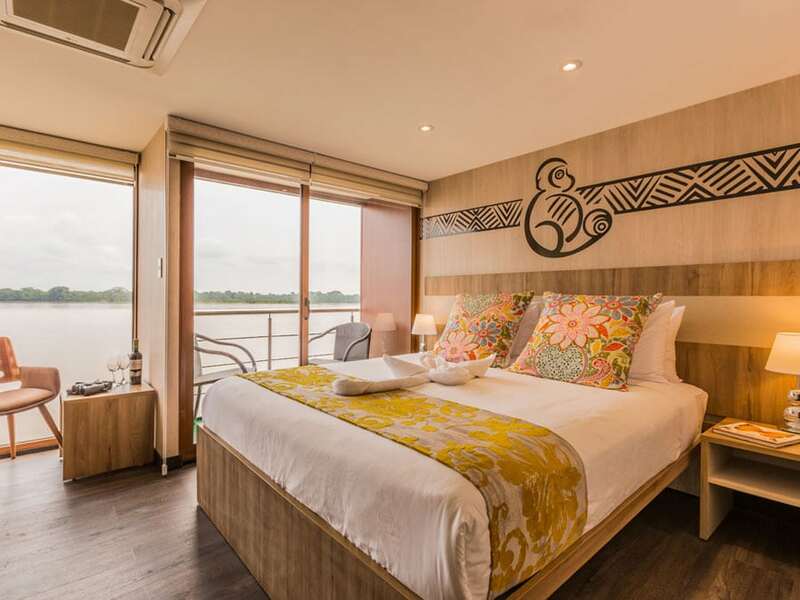 The Alya offers a total of nine cabins, which includes eight with a private balcony. Four of the cabins are located on the upper deck and five are on the main deck. The cabins feature comfortable beds, an ocean view, private bathrooms, cold/hot water and air conditioning. In addition to the Alya’s very comfortable cabins, you can also enjoy the social areas. These include the lounge, sundeck and dining room. The dining room is where you will enjoy delicious cuisine inspired by the region and Ecuador, as well as international favorites. Activities on the Alya Galapagos Cruise include guided island walks, kayaking experiences, panga rides and snorkeling. On each experience, you guide will be help you to spot some of the famous wildlife of the Galapagos Islands. The Eco Galaxy provides a first-class experience of the Galapagos Islands. Enjoy a comfortable cruise as you voyage from island to island. The vessel offers eight cabins in total with four found on the upper deck and the other four on the main deck. All of the cabins feature twin beds or double beds, private bathrooms, hot water, air conditioning and both telephone and internet communication. 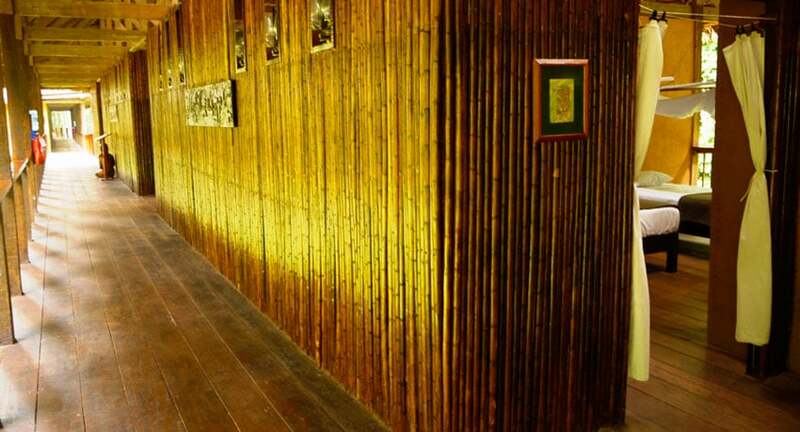 In addition to your cabins, relax in the comfortable social areas. These include the sundeck for enjoying the sunshine or viewing the constellations, the lounge area for relaxing with a cocktail or book, and the dining room for delicious cuisine. Aboard the Eco Galaxy, you will enjoy a variety of activities. These include guided island walks, wildlife watching, kayaking trips, snorkeling, swimming and photography. In addition to the famous Galapagos wildlife, see beautiful scenery, learn of the history and enjoy spectacular natural features. The Galaxy Yacht provides a first-class cruise of the Galapagos Islands. There are nine cabins with four cabins on the upper deck, three on the main deck and two on the lower deck. Social areas on the vessel include the lounge, bar, sundeck and the dining room. For your meals, enjoy a variety of dishes from Galapagos and Ecuadorian cuisine to international favorites. Special diets call also be accommodated with prior notice. The comfort of the cruise vessel is only to complement the incredible islands and wildlife watching opportunities. You will explore the islands on guided trail walks, kayaking experiences and panga rides in addition to specific wildlife watching excursions. However, you will still be looking for the iconic animals on all tours. The Nemo III Galapagos Cruise is motor-sail catamaran. The Nemo III accommodates 15 passengers for a tour of the northern or southern islands. Focused around two 8-day itineraries, you can still join the cruise for cruises of 4 or 5-days if you have limited time available. Explore the islands with certified Galapagos guide to find iconic animals of the islands, including the marine iguanas, blue-footed boobies, pelicans, sea lions, sea turtles and more. The Nemo III offers a choice of twin or double cabins, which each feature a private bathroom with hot water. Enjoy delicious regional cuisine in the dining room and relax in comfortable social areas between excursions, including the spacious sundeck and jacuzzi. A smaller vessel than the Nemo III, the Nemo II is another motor-sail yacht offering a comfortable and adventurous experience of the Galapagos Islands. In addition to an island hopping adventure, certified Galapagos guides will lead daily excursions on the islands. Your guides will help you find the iconic wildlife, including marine iguanas, blue footed boobies, sea lions, giant tortoises and much more. With such an amazing diversity of life, there are also fascinating things to see in the water. You will also enjoy guided snorkeling experiences to see colorful fish, sea turtles and hopefully some other Galapagos marine life. Choose from double or twin cabins, which each includes their own private bathroom. 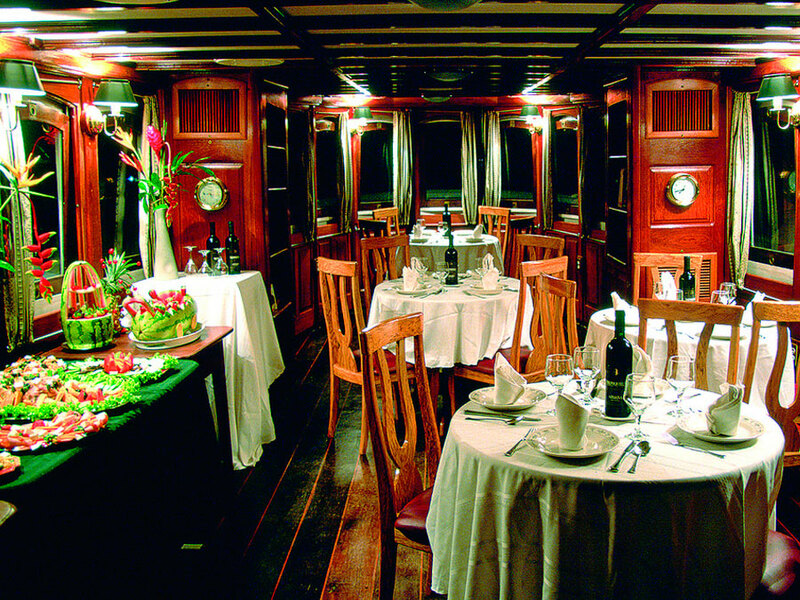 The vessel then offers comfortable social areas and the dining room where you will enjoy delicious regional cuisine. The Finch Bay Galapagos Hotel is one of the highest rated hotels on the Galapagos Islands and offers some fantastic package tours for island exploration. Including accommodation, transport, all meals and accommodation a favorite option is the Finch Bay Complete Package. This itinerary operates over 4 or 5 days and includes guided wildlife exploration, island hopping to Bartolome and Santa Fe Island on your choice of one or two days aboard a private yacht, and walks in the highlands of Santa Cruz. Another highly rated hotel for the Galapagos Islands, the Galapagos Safari Camp offers fantastic package tours for a classic experience, family focused adventures and diving vacations. Your first day of the experience will involve a guided walk to find giant tortoises, the island’s most iconic animal. While in the highlands, explore the area to see lava tunnels and beautiful scenery. Over the next few days, visit North Seymour, Bartolomé, Plaza and Santa Fé Islands. See ancient red, black and orange lava fields, Pinnacle Rock, and much more wildlife. Spot the many sea lions, penguins, Galapagos hawks, marine iguanas and Sally Lightfoot crabs.